Life as a coterm or masters student can be tough — especially when undergraduates and Ph.Ds get most of the attention (RAGHAV MEHROTRA/The Stanford Daily). Though she has had a generally positive time at Stanford, for Kate Bridges-Lyman M.A. ’15, a masters student in religious studies, the life of a masters student can feel disconnected from other members of the campus community. Of Stanford’s 9,118 graduate students, Bridges-Lyman is not the first to raise concern about a differing sense of community between undergraduates, masters students and doctoral candidates. Both in Stanford’s traditionally-structured masters program and in the coterminal masters program in which students can begin to work toward getting their masters degree while finishing their undergraduate degree, some students feel as though the sense of community and resources available to masters candidates is not equal to that of undergraduates and Ph.D. candidates. While most undergraduate degrees are completed in four years and Ph.D. programs typically last five to six years, traditional masters programs can last two to three years, and the coterminal program at Stanford often extends just one year beyond the undergraduate degree. Given the range in length of the three programs, some masters students felt that this puts them at a disadvantage. There are additional differences among coterms and traditional masters students at Stanford, one of which is that many traditional masters students come to Stanford from other colleges. For coterminal students, there may be some benefit in having come directly from an undergraduate education at Stanford. Masters students coming from another college often spend less time on campus. According to Sean Scott ’14 M.S. ’15, coterming while he was still a junior felt like “a natural continuation” of his Stanford career. “If I had gone to a different school for my masters, that would have been a very different experience because the class structure might be different, [and] the professors are completely different,” Scott said. Not all coterm students necessarily agree with this characterization. For Peri Unver ’14 M.A. ’15, who will be graduating with a masters degree this year, although the coterminal program offers a great opportunity to finish a masters degree quickly, the social transition from undergraduate to graduate life has not been very smooth. Another aspect of masters program life that some students describe as isolating is housing. While the majority of undergraduates live on campus for all four years and the draw system is well established, housing isn’t as consistent for masters students. 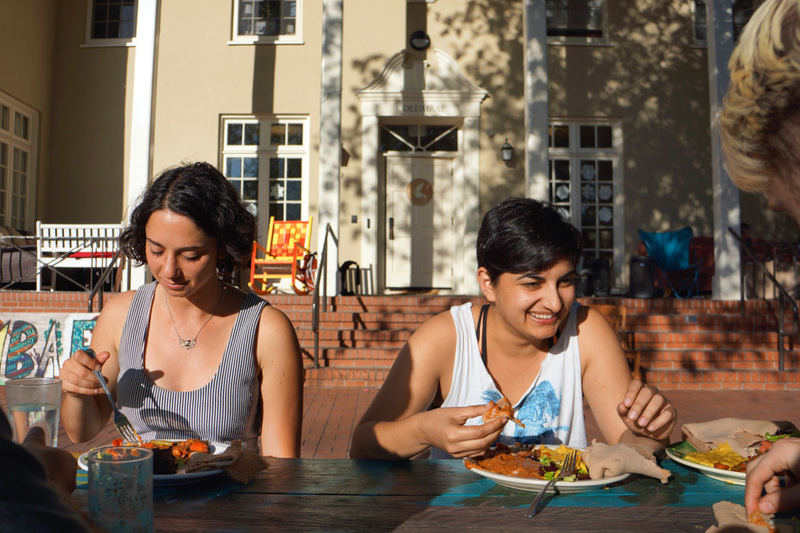 Co-term student Sherri Billimoria (right) retains a sense of community by becoming “eating associates” at Columbae. According to Bridges-Lyman, many of the students she has met in classes are either married and living off-campus or are Ph.D. students given on-campus housing, which made it difficult for her to find a tight-knit community. Bridges-Lyman added that being a part of a small cohort of four students within her department has restricted her access to other masters students. Although Unver lives in an undergraduate dorm and has a dining plan, she feels that the experience is quite different from when she was an undergraduate, where she felt a sense of community in her dorm and in the dining halls. “Not that the dorm I’m staying in doesn’t have [a community], but I think that I myself just feel a little bit different now – a little bit older,” Unver said. Nevertheless, graduate programs do try to create programming which helps the students transition into their new space and find a sense of community. “There’s a ton of resources on Stanford’s campus, but it’s so spread out, and so many departments are doing so many different things it’s hard to identify where to go for specific needs and [whom] to ask when you need help,” El-Ghazaly said. Although El-Ghazaly acknowledged bias against masters students in regard to housing and perhaps teaching positions, she said that there are resources that all graduate students can utilize. Every department at Stanford offers student services to help graduate as well as undergraduate students both academically and socially. Caitlin Azhderian, the Director of Student and Academic Services in the Electrical Engineering Department, explained that they are trying to help graduate students with their different needs. Regarding coterminal students’ concerns over a lack of community, Azhderian indicated that they have been trying to address this problem through organizing lunches for specifically coterminal students in the department. “At those lunches we have our entire student services team present so that we can help answer questions that [students] may have about this transition from their undergrad into the graduate program and how that is different and what paperwork needs to be filled out and what milestones need to be set,” Azhderian said. “I do think the efforts that we’ve taken over the past few years and partnering with the student groups… have certainly helped to build community especially among our graduate students,” Azhderian added. Contact Sevde Kaldiroglu at sevde ‘at’ stanford.edu. Sevde Kaldiroglu ’17 is a sophomore hoping to double major in English (Creative Writing) and Psychology. She was raised in Istanbul, Turkey, and decided to come to Stanford to pursue her passion of writing. A staff writer for the student groups beat at the Stanford Daily, Sevde is also the editor-in-chief of Avicenna - The Stanford Journal on Muslim Affairs. She also enjoys swings, drinking Turkish coffee, and fortune-telling. To contact Sevde, email her at sevde ‘at’ stanford.edu.